Woody Allen's "To Rome with Love" Woody Allen's "To Rome with Love"
Woody Allen’s seventh postcard from Europe lacks enough postage. It should be rubber-stamped “Return to Sender.” This is undoubtedly the most disappointing of all his films set in Europe. Following a lifetime spent channeling New York’s neurotic side, creating some of the most memorable roles in modern film history (Annie Hall, Leonard Zelig, Danny Rose, and of course – Allen himself), the 76-year-old film legend abruptly departed his familiar Manhattan backdrop in 2004, taking his introspective wit across the Atlantic, initially to London, then Barcelona, followed by Paris, and now Rome. His latest release To Rome with Love has all the ingredients of yet another tasty Allen stew. But in the end, all we sample is watered-down broth, poorly seasoned, with stale recollections of the spicy flavors that made Match Point, Vicky Cristina Barcelona, and Midnight in Paris so thoroughly original and enjoyable. To be fair to Allen, he’s coming off his biggest commercial success ever, which is a hard act to follow. Since his heyday as a writer-director-star during the 1970s, Allen’s films haven’t performed particularly well at the box office. But like summer stock theater, they tend to make just enough money to keep Allen atop the list of directors most actors long to work with. For that reason, Allen pretty much gets his pick of the litter as to who he casts in his films, and often writes characters perfectly suited to the typecasting. Indeed for Allen, the blockbuster 2011 hit Midnight in Paris was tough to match – either critically or commercially. 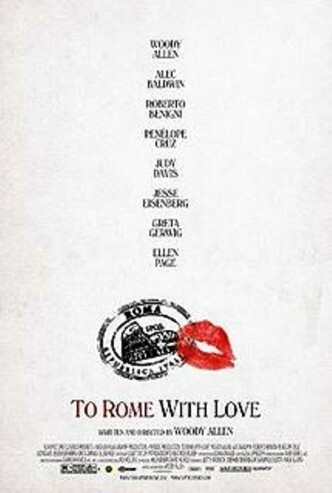 But not only does To Rome with Love fall far short, it doesn’t even belong on the same continent. The plot is very familiar territory for fans of Allen’s films. Three stories are supposedly entwined, full of quirky characters, ultimately providing audiences with humor, greater understanding, and ultimately– revelation. That was supposed to be recipe. Trouble is, this time around none of the stories Allen has penned are particularly interesting or memorable. Predictably, Allen does manage to steal one segment, playing a bored American retiree who is accompanying his wife to Italy. They are scheduled to meet their daughter’s soon-to-be husband, and family. As one can imagine, the interaction between Allen and the non-English speaking Italian family has its moments. The story blossoms when Allen unexpectedly discovers the Italian father can sing like Caruso. But the high point of this operatic mini-drama becomes too forced, testing the audience’s patience to say nothing of straining credibility. In the second story, Jesse Eisenberg (The Social Network) plays an American student living in Rome along with his girlfriend. When the girlfriend invites “Monica” to pay a visit, played wonderfully by Ellen Page (Juno), Eisenberg becomes infatuated with the new house guest and the fireworks begin. The always reliable Alec Baldwin, perfectly cast as the debonair know-it-all, oddly provides a voice of reason during Eisenberg’s degenerative courtship, hoping to stop his protege from making a complete fool of himself. The final story seems both camp and patronizing, cookie-cutting arguably the only Italian actor widely recognizable to American audiences (Roberto Benigni — Life is Beautiful) as the warm roasting chestnut to provide some wildly-exaggerated depiction of the “average” Italian. This story gets old quick, and drags down what would otherwise be at least a mildly entertaining film. Italy should be perfect canon fodder for Allen’s innumerable idiosyncracies. A nation of wildly-gesturing people full of passion about everything — art, soccer, food, whatever — seems the perfect foil for all of Allen’s self-centered New Yorkers. Instead, the opportunity is wasted. The film might as well have been shot in Cleveland. Without giving away too much, there’s no payoff in the end. For audiences expecting to see the combustible explosion during the final climactic scene from Allen’s vast cinematic laboratory, we are left wondering why any of this mattered. And that’s the trouble – it didn’t. In his masterful 47-year film career, Allen rarely delivers a product that seems so unfinished. It’s as though Allen wrote a (somewhat decent) first draft, and then suddenly called in the cameras to start shooting. Allen knows very well that greatness comes through time and repetition. Like fine wine, this one needed to age a bit. It was served far too early. And like so many bad Chiantis, the tannins were overwhelming to the point of being undrinkable.